Illegal hunting and trade of scorpions is thriving in the country, particularly in Sindh. Though no case relating to the illegal catch of scorpions has been officially reported from Sindh, at least two have been reported from Kotli district of Azad Jammu and Kashmir (AJK) in recent days and confirmed by AJK wildlife officials. “Two men carrying boxes filled with four to five dozens of live scorpions were caught in Kotli on Sunday. They were fined and a case against them was registered,” AJK Wildlife and Fisheries Director Javed Ayub said, adding that the people taking the consignment to Lahore belonged to Mandi Bahauddin and Gujranwala. They had lured local people into catching all kinds of scorpions by offering them big amounts of money, according to Mr Ayub. 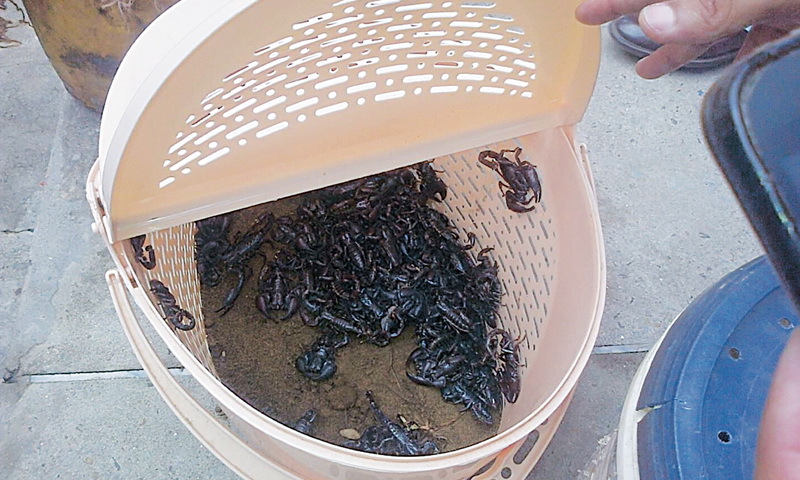 “A similar case was reported from Mirpur a few days ago when three persons were caught with five kilograms of live scorpions. They were fined Rs60,000 and the scorpions were later released in their habitat,” he added. Ayub said the suspects were identified as Khalid Mehmood, Faiz Hussain and Sajid Mehmood who had collected the catch from Mirpur, Kotli and Bhimber districts. The AJK wildlife rules, according to Ayub, didn’t have specific clauses relating to scorpions, so the action against the hunters/traders was taken under general laws. “This is because the species had not been under threat earlier, but the way people are catching it may make it an endangered one. That’s why we have got hunting of scorpions banned in 10 AJK districts under Section 144 Criminal Procedure Code,” he explained. According to Sindh wildlife sources, the issue has been in the officials’ knowledge for months but no case has been officially reported so far. Mithi and Mirpurkhas are the prime areas from where the species is being caught. Wildlife conservator Javed Mehar said he was aware of the illegal scorpion trade and had directed the staff as well as the officials concerned at the port and airport to keep a check on it. There are two theories circulating in the wildlife circles about the trade flourishing in recent months: one is that the species is a favourite dish for foreigners working at a number of projects in the country. It is on record that when some foreigners were working at the Jamshoro power plant, they used to pay handsome amounts to people for hunting certain animals that are not locally eaten. Some wildlife experts, however, attributed the trend to an increase in demand of scorpions from some foreign pharmaceutical companies for their use in preparing anti-cancer compounds. “I think they are seeking a significantly big quantity of the compounds in order to get a patent for the medicine. If it is so, the federal government must ratify the Nagoya Protocol on Access and Benefit Sharing (an international agreement on fair and equitable sharing of the benefits arising out of the utilisation of genetic resources) and have relevant provincial legislation so that Pakistan could also get a benefit if a medicine is indeed developed by using our scorpions or any other species. Right now, Pakistan is only a signatory,” a wildlife expert said. Mass hunting of native species like scorpions that feed on certain insects would cause irreparable loss to biodiversity as their resultant shortage may lead to an increase in the population of some other species that are not favorable to the environment.